1. Place the chickpeas, garlic, cumin, tahini and lemon juice in a food processor. With the motor running, slowly drizzle the olive oil through the funnel, until the mixture is well combined but still a little chunky (add a dash of boiling water if it’s difficult to blend). Season liberally with sea salt and blend again. 2. 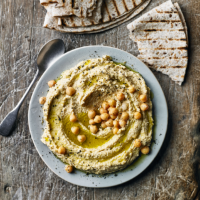 Spoon the houmous onto a serving plate and garnish with the reserved chickpeas. Drizzle over a little olive oil and season with freshly ground black pepper.